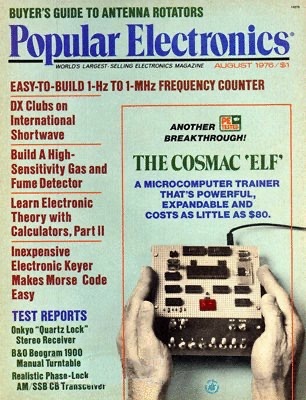 Celebrate the 40th anniversary of the COSMAC ELF computer by participating in a build of one at the Vintage Computer Festival Midwest --- and possibly taking it home with you! The idea is simple: drop by our booth at the festival and wire-wrap a connection or two (we’ll have the parts and tools and will show you how). Everyone who participates will get a raffle ticket, and the newly built ELF will then be raffled off. Bring your favorite kid along and give them a taste of microcomputing’s early days. The design and build is very similar to the original ELF, but with a few improvements to lower its power requirements and provide for easy expansion. The design is primarily the work of Lee Hart (creator of the tiny, popular Membership Card computers) and Josh Bensadon, with parts donated by several community members.